"If We Can Stop Monsanto, We Can Change The World"
What began with a few neighbors meeting to find out what it would mean if Monsanto located in their town, turned into hundreds, thousands and, within weeks tens of thousands of residents and supporters organizing regular demonstrations and creating an ongoing blockade of a construction site. Not just any construction site, the location of what would have been -- if not for people's power -- the largest genetically modified seed processing plant in the world. The town of Malvinas stopped Monsanto. Their story and inspiration resonate across the globe. As Vanessa and others reflected, if they can stop the giant Monsanto they can change the world ... and little by little they are doing just that. The struggles to defend the earth, water, air and commons in Latin America is ever increasing, with stories of mega mining projects halted by communities using their bodies as blockades and damming projects halted by assemblies of neighbors. One of these many examples is in the town of Malvinas, a town of 12,000 residents and a lot of energy located in the north of Argentina just outside Cordoba. "We first heard about the arrival of Monsanto and their claim that they were going to build what would have been the world's largest genetically modified seed processing plant in our town, Malvinas, by way of a media announcement by Argentine President Cristina Fernandez de Kirchner, while she was in the United States. Malvinas is already a very polluted city -- a contaminated city. It's surrounded by soy crops and the fumigation is toxic. Half of our town's 12,000 inhabitants are children under 18, and the children are suffering terrible health consequences because of the fumigation. Those who live nearest the fields have tremendous problems with leukemia and cancer, particularly the children, and many kids also have asthma, allergies and respiratory problems. Women regularly suffer spontaneous abortions. We are already sick. To put Monsanto so close to our homes would end up killing us. The plan was to put Monsanto within 800 meters of the largest school in the town. Our resistance began on July 24th 2012 when a group of us neighbors came together and invited Dr. Raul Montenegro (a biologist who specialized in these issues) to meet with us to explain what a Monsanto plant might mean. Within two weeks we organized The Assembly of Malvinas, made up of neighbors -- regular people -- almost none of us had ever had any organizing experience before. The first assemblies had many hundreds of people. We organize in a horizontal way in the sense that we don't have a leader and we all make all the decisions together. The police got very angry at this because every time we had a demonstration they asked "Who is the leader? Who's in charge?" and we would say, "No, we are all leaders, all of us command." Back to the beginning ... after that first assembly we immediately began to organize large marches in the city of Cordoba, to gather signatures and demand meetings with the mayor and with different organizations. Different groups were already fighting against Monsanto in Argentina and they came to Cordoba to show solidarity. We managed to organize marches in Cordoba, the provincial capital, of more than 10,000 people, and to gather a large number of signatures. From the beginning we demanded they comply with the National Environmental Law of Argentina, which says that before any such venture companies must first submit an environmental impact study that has to be approved, including by doing a popular consultation in the area proposed. We tried everything peaceful and non-confrontational at first with the signatures and the marches until finally, together, we began to block the construction of the site. You can't imagine the anger and pain we had when we watched the Monsanto trucks filled with construction materials pass by, knowing they were going to build something so toxic for us. We knew it was an extreme measure, but it had to be done. We began to study, to observe their movements and see which days most supplies were arriving by truck, things like cement, etc. We found that Tuesdays and Wednesdays were when they would move the most material so those were the days we created human barriers; standing in front of the trucks with banners and flags that said "No Monsanto", "Out Monsanto" and the "Assembly of Malvinas". If they wanted to move the material they would have to run people over -- so they turned back. Of course this caused lots of clashes and provoked a lot of discussions, but we knew this was our only way to stop them from building the plant. On September 18, 2013 we organized a huge festival at the gates of the construction site called "Spring without Monsanto". There were tons of people and organizations from all over Argentina, not just environmental groups either. There were neighborhood organizations and community groups; people from the South who were fighting a mining project, and the assembly from la Rioja who had stopped the mining in their area; there were indigenous people from Chaco and Paraguay and some from Brazil, who are also fighting against genetically modified soy; there were many from Uruguay and even Central America. The feeling for all was the same -- we had to stop the monster of Monsanto. Many journalists also came to cover the story. It was then that we decided to create a permanent camp at the gates of the site until Monsanto withdraws from Malvinas Argentina. 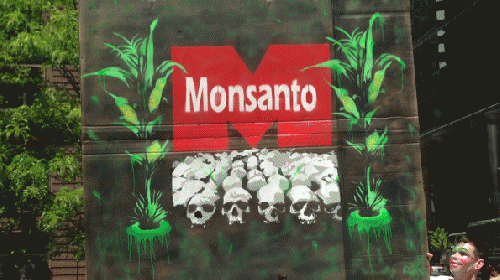 Monsanto will lash back. They will try again. And all political parties agree on the topic of Monsanto: the President of Argentina is one party and that supports Monsanto, the governor of Cordoba is another and that supports Monsanto, and the mayor of Malvinas yet another and that supports Monsanto. There are no differences, all are unfortunately aligned under money. Monsanto will also try and buy people. Last year, in 2014, Monsanto worked very hard in the town of Malvinas to try and show people it is good and try and win their support -- using the typical patronage system that other multinationals use in small towns -- offering all expenses paid trips to big cities and towns, such as La Roja or Buenos Aires, or things like trainings, craft workshops, scholarships to students, cultural art workshops for children, as well as gifting things like mate, thermoses, notebooks and pens. The company even donated an ambulance to the hospital in Malvinas, all gifts to say, "look how good Monsanto is" and "Malvinas' progress is with Monsanto". But we will resist -- we will never stop resisting. The assembly continues to meet all the time and there is still an encampment. For three years the assembly has been meeting in the home of a neighbor or in a public place. Today we are a core of a few dozen who meet all the time, not the same 400 as in the beginning, but there are many many people who will always participate if needed -- there are rings and rings of us. We are like an onion. People may not participate in the meeting every week but if asked people will do whatever has to be done. The same is true for all of the groups and organizations who supported us - unions, students, other groups with whom we are in contact, the other assemblies from around the country and around the world who we stay in contact with. Marina Sitrin is a writer, lawyer, teacher, organizer and dreamer. She is the editor of Horizontalism: Voices of Popular Power in Argentina (2006) AK Press, author of Everyday Revolutions: Horizontalism & Autonomy in Argentina (2012) Zed Books, and together with Dario Azzellini, the co-author of They Can’t Represent US! Reinventing Democracy From Greece to Occupy (2014) Verso Books and Occupying Language: The Secret Rendezvous with History and the Present (2012) Zucotti Park Press.